The Duchess of Cambridge Kate Middleton was in attendance at a glittering state banquet held in honour of the King and Queen of Spain. Kate Middleton wore perhaps one of her most daring necklines ever, and surely stunned in the custom-made pink Marchesa v-neck lace gown. 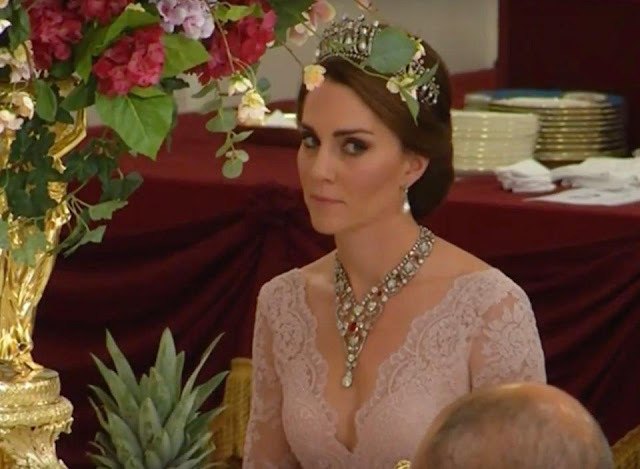 The dress seemed quite a controversial choice for the Duchess, who usually favours conservative outfits and demure necklines. 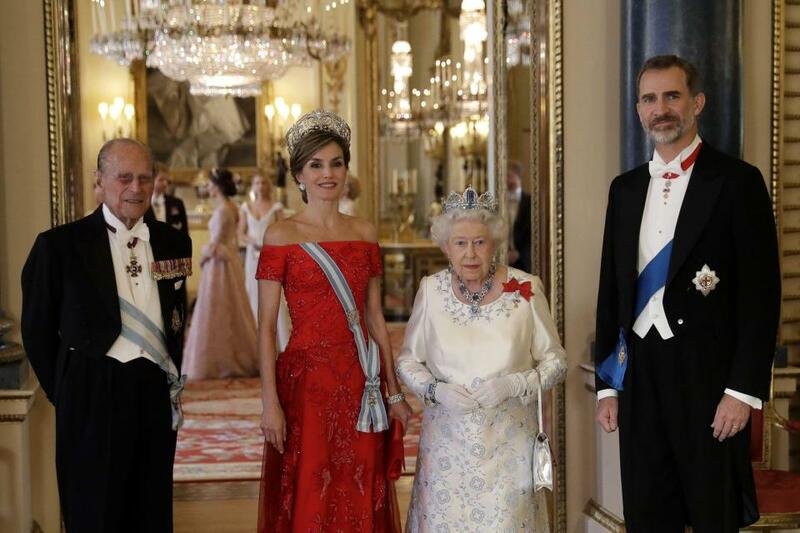 Kate, 35, joined Prince William, the Queen, the Duke of Edinburgh and other royals to welcome King Felipe IV and Queen Letiza to the Buckingham Palace. 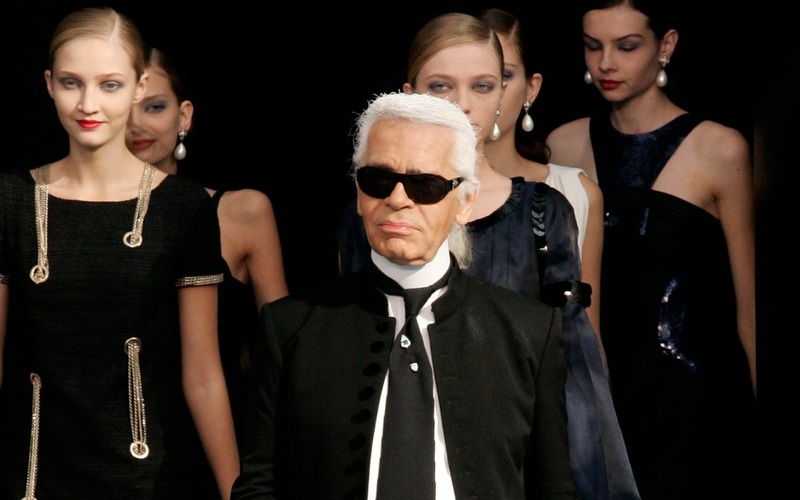 Despite being glamorously dressed, Kate remained out of the spotlight, ensuring the royal guests, especially Queen Letiza, remain in the limelight. 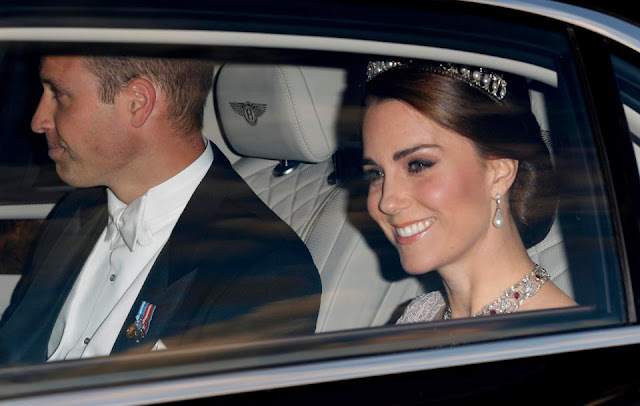 For the occasion, the Duchess of Cambridge also wore her late mother-in-law Princess Diana's iconic Lover's Knot tiara, along with a dazzling ruby and diamond necklace that belongs to the Queen. 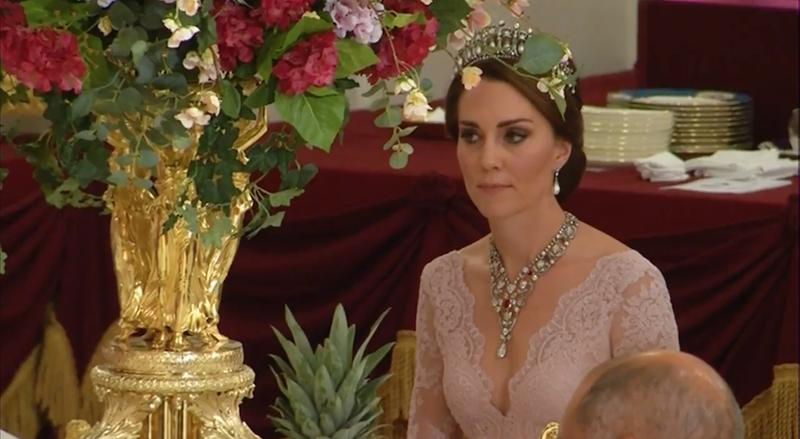 Kate Middleton also wore the lavish Lover's Knot tiara, set in diamonds and pearls, last year at the 2016 Diplomatic Reception hosted by the Buckingham Palace. Kate's decolletage was accessorized with the luxury statement jewels, and the ensemble was complete with the Duchess's favourite diamond and pearl drop earrings.